I created this found poem, using some of the Jigsaw poem technique. With the Jigsaw poem Sidman uses a found poem and reshapes the poem. With the found poem any document that is not a poem is used to construct a poem. It can be anything from a list, postcard, letter to graffiti, travel guide and history book. These are mined for interesting images and words which are thrown up into the air and used to inspire a new work. 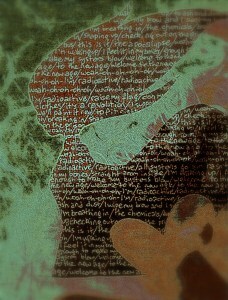 It is a collage of words found in other texts. You can of course add more of your own words to make it all make sense. I am going to pluck words and ideas out of two contrasting books: An Astronomy Guidebook and The Collected Poetry of John Clare. I have picked them because of John Clare’s attention to small details – and the astronomy book’s sweep of the universe. Looking closer the poem I want to be inspired by was John Clare’s Poem -‘Songs Eternity’, which does have a slightly expansive feel to it, and any section of Robert Burham’s, Astronomy (Home Reference Library) that is interesting. This is a fun writing game to play. I found using two texts more inspiring than using a single one. This poem is part of a series – The Diviner. aiming her camera at the sky. falling into his kingdom’s river. Although I am having a break from most blogs and social media – I thought it would be fun whilst the family are on holiday to create some ‘found’ poems with a theme of universe and to create a few extended metaphors. I enjoyed doing this when doing a recent poetry exploration of forms based on suggestions at Joyce Sidman’s website. This one above, looks like two characters in a situation of drought just came into being. I wonder if they could be part of a new series. Time will tell. This one was inspired by a text book on astronomy and a book on Pacific Mythology. I have picked them because of John Clare’s attention to small details – and the astronomy books sweep of the universe. Looking closer the poem I want to be inspired by is John Clare’s Poem -‘Songs Eternity’, which does have a slightly expansive feel to it, and any section of Robert Burham’s, Astronomy (Home Reference Library) that is interesting. This is a fun writing game to play. I found using two texts more inspiring than using a single one. I wasn’t that keen to write about snow and winter as in the exercise of Sidman. This one of my found poems, which I created when doing poetry in English. They are so much fun to do. I used an old paper back book and renovated it to create this. 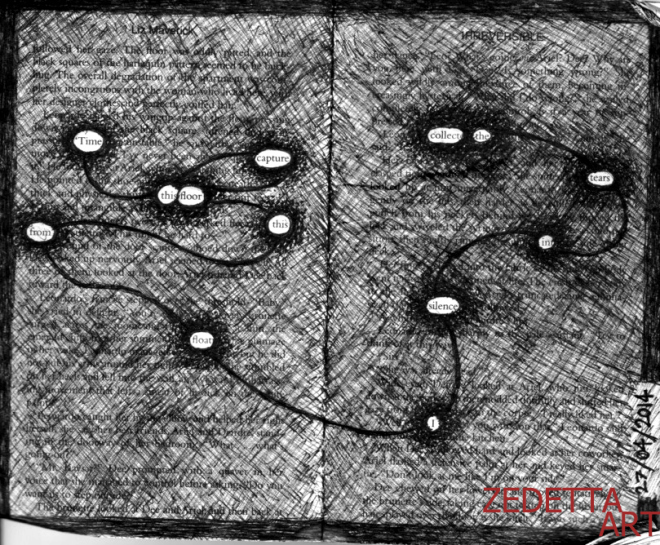 (c) Image Zedetta Art – all rights reserved.